If you are wondering how long it will take to recover from dental implant surgery, it’s important to understand that recovery depends on the extent of your surgery. How many implants are you having placed? Where are those implants located? Will you need bone grafting? How good is your overall health? Fortunately, advances in diagnostics and techniques have improved all aspects of implant surgery, including making recovery faster and more comfortable. Just as with any surgery, recovery depends on the extent of your surgery and your own personal health. 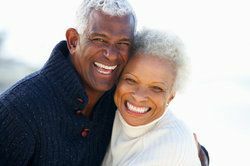 To gain a clearer understanding of dental implants and how recovery would look for you, contact Dr. Maurice Benjamin, who has offices in both Manhattan and Brooklyn. He can explain the dental implant recovery process. Dr. Benjamin specializes in cosmetic dentistry tailored to each patient’s needs. Your health and the extent of your implant surgery will influence your recovery. If you are healthy and heal quickly from cuts, then you can expect to heal faster. As a comparison, a young person in good health and with good nutrition who takes antibiotics would recover faster from the same surgery than an older person who is diabetic and smokes. The healthy younger person may recover in a day or two, while the older patient in poorer health may take a few weeks. Naturally, the more implants that are placed, the more extensive your surgery will be. This can prolong your recovery and increase your discomfort. A single implant in healthy bone would be expected to need only a few hours of downtime. If your surgery is more extensive, with bone grafts and multiple implants, recovery would take longer. Rather than a few hours of downtime, your dentist may recommend you take several days off to rest. Minor discomfort for a few days. Some people may want to take over-the-counter pain medications, while others won’t need anything. It will depend on the extent of your surgery and how sensitive you are to pain. Of course, the more implant sites you have, the more soreness you will likely experience. Most people will be able to return to normal activities quickly. A single implant usually results in little discomfort and some people may be able to go back to work the same day or by the next morning. If you have multiple implants, you may want the weekend to recover. You may have swelling or puffiness, and the chance of these increases when surgery is more extensive or if bone grafting is performed. You will want to stick to a soft or liquid diet for three to five days after surgery. As you feel more comfortable, you can introduce a more normal diet. Recovery from implant surgery is highly dependent on your situation. Because there are so many factors that influence recovery, a personal consultation is the most accurate way for you to anticipate what recovery will look like for you. If you need information, please call for a consultation.